Basic Hat Pattern: Basic Hat Pattern, Version 12-B, "Two Tones"
One Basic Pattern! Endless Possibilities! Hats Always On My Head! It's so great to have you visit my hat blog! My goal is to showcase the potential of even the most novice crocheter to be able to stitch together the most beautiful beanies, berets, and brain-warmers they never dreamed possible! Please share your photos so I may place them on my Flickr page and here on this blog! I'm looking forward to sharing your hats with others and I just love to see what you have created! Basic Hat Pattern, Version 12-B, "Two Tones"
Notes: This hat stops just below the ears, more rows can be added if a longer hat is desired. I used the new Red Heart Premium Worsted Acrylic called "With Love". Gauge: not important, hat runs big. Ch 4, sl st in first ch made. Rounds 7 -11. Repeat Round 6. Rounds 13-17. Repeat Round 6. Basic Hat Pattern has a Facebook page! 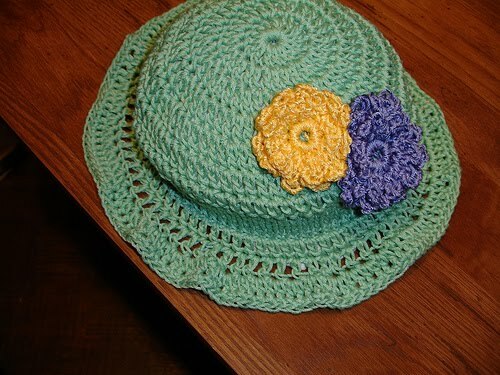 I am still adding pictures, and other "stuff" relating to my hats! I plan to post info on hat designs I am working on, other future designs, and any hats I am ready to place on my blog! I am working furiously on ideas for the year 2013! Awesome details coming soon! Thanks for checking me out! I love to create hats! I created this pattern out of necessity when I was diagnosed with breast cancer. For years friends and other crocheters have requested this pattern. Finally I have written it down and decided to share my basic pattern. I have created many hats by starting with this basic hat pattern. Most of my hats are simple and easy to make. Have you thought about your Crochet New Year's Resolutions? I'm thinking! I'm making foundation chains in my head now! My Resolutions for 2011 I did try to make it but Mom and my poor time management got in the way! 1. I'm going to see how many hats for charity I can create in one year! 2. I'm also be more consistent in getting hat patterns up on my blog! Basic Hat Pattern, Version 100-A, "Layered"
Basic Hat Pattern, Version 100, "Layered"
Homemade bread is so yummy! Healthy and otherwise! Reading is awesome too! Books and yarn are a huge part of my life. I can’t live without reading my Bible daily. I have 2 grown children. I’m beginning to think they don’t know how to make grandchildren! Been married almost 40 years. I am mom’s caregiver. She has Alzheimer’s disease. sad. For a breast cancer patient.